VietNamNet Bridge - ‘Kong: Skull Island’, an American film with many scenes shot in Vietnam, to open in cinemas on March 10, is expected to bring a golden opportunity to Vietnam to attract travelers and develop the tourism industry. A report of the General Statistics Office (GSO) showed that in February 2017, Vietnam received 1.19 million foreign travelers, an increase of 19.1 percent over the month before and 42.2 percent over the same period last year. More than 2.2 million foreign travelers have visited Vietnam so far this year, up by 33 percent. According to Nguyen Chau A, director of Oxalis, the company which gave support to the filming, when giving interviews to the press, actors and the director all mentioned the beautiful landscapes in Vietnam. And this is the opportunity for Vietnam to provide images about the beautiful landscapes and launch ad campaigns to attract tourists. In February 2017, Vietnam received 1.19 million foreign travelers, an increase of 19.1 percent over the month before and 42.2 percent over the same period last year. Most recently, the Quang Binh provincial authorities released a clip abroad to promote tourism with the introduction from director Jordan Vogt-Roberts. A plan on designing a tour related to the film has also been drawn up. Not only Quang Binh, but other localities can also grab the opportunity to attract travelers. The government decree on granting e-visas to citizens from 40 countries which took effect in early February has simplified administrative procedures for visa granting, thus luring more travelers. After a period of decline, the number of cruise travelers to Vietnam has bounced back. Phan Xuan Anh, director of Du Ngoan Viet, said the number of cruise travelers so far has increased by twofold compared with the same period of last year. The company has signed a contract to receive high-end cruise travelers from China. Saigontourist has received 2,200 cruise travelers who came to Nha Trang City on Celebrity Constellation. They were from the UK, US and Canada. The total number of cruise travelers served by the firm in the first two months of the year increased to 50,000. In 2017, VNAT hopes to receive 11.5 million foreign travelers, 66 million domestic travelers and obtain turnover of VND460 trillion. Travel firms, hoping to compete with regional countries in luring more foreign travelers, have proposed to the government to expand the visa waiving policy to key markets. 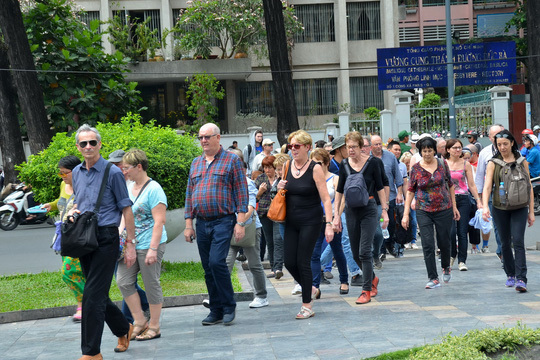 The HCMC Tourist Association has sent a dispatch to relevant ministries, asking to waive visas for the citizens of Australia, New Zealand, the US, Canada, Austria, the Netherlands, Belgium, India and Uzbekistan. Bui Ta Hoang Vu, director of the HCMC Tourist Department, had proposed to expand visa waivers for travelers from New Zealand, India, the Netherlands, Canada, the US and Australia.